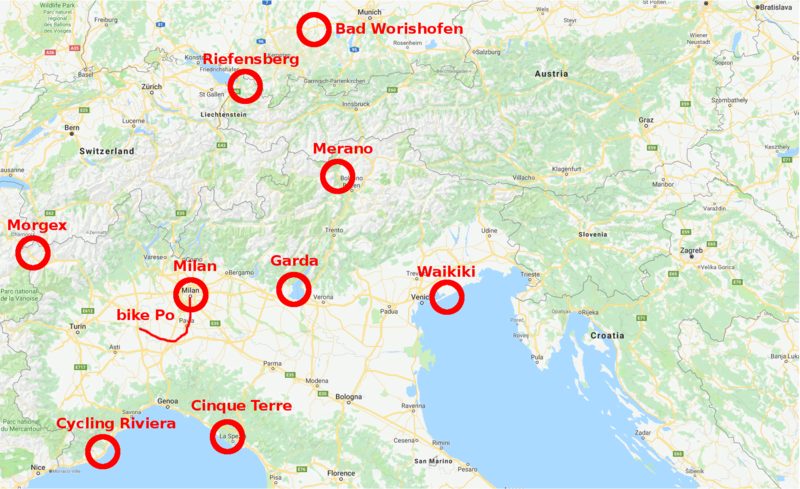 We have various plans at the beginning (go through the Balkan countries and then take ferry and get to the south of Italy, or cycle at Corsica). 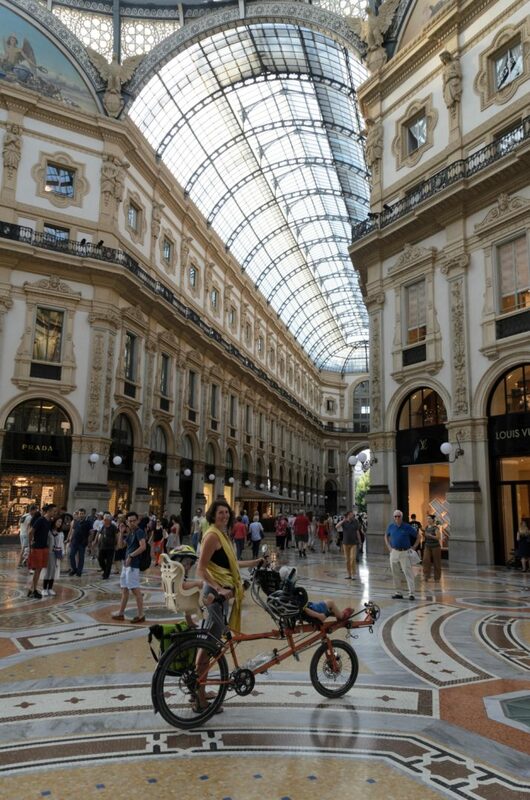 At the end we decide for a trip to Italy only – it’s a big country with lots to see. 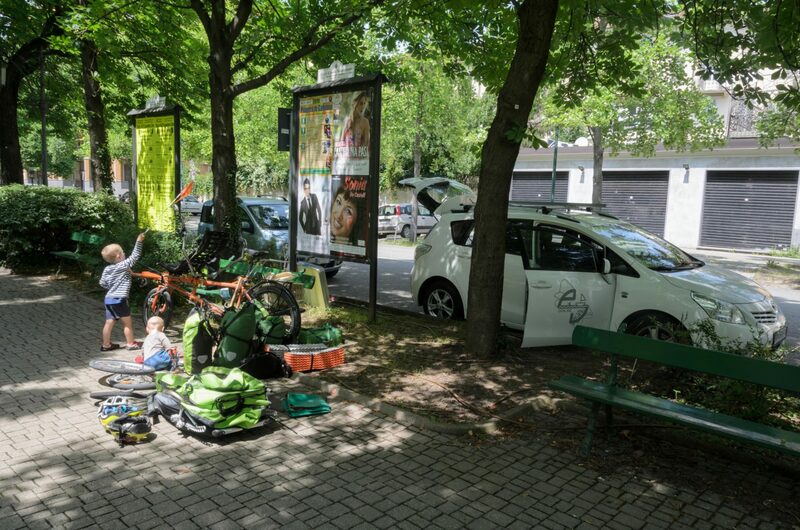 Realistically we choose the combination of car and bicycle because pure bicycling would be too difficult in current situation with children. Two other families of friends join us – so we are 6 adults and 6 children. As usually we postpone the departure day… we are sick, Evit needs to do some bureaucracy (this is also her university “business” trip), we add stickers on the car and prepare business cards. 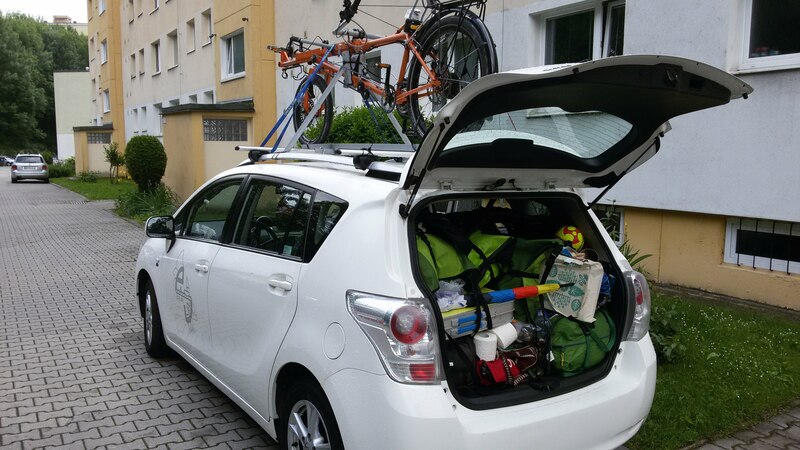 On 17th of May we are finally packed with the bike on the roof and head south. We don’t estimate the distance and time correctly and we get to the camp next to Venice (Lido di Jesolo) almost at noon. It was too much sitting in the car for children and the last 40km we are hearing Kolko’s screaming. We spend these days at the sea – water is still cold, but because many of use like to swim even in ice water in winter, we dip in. 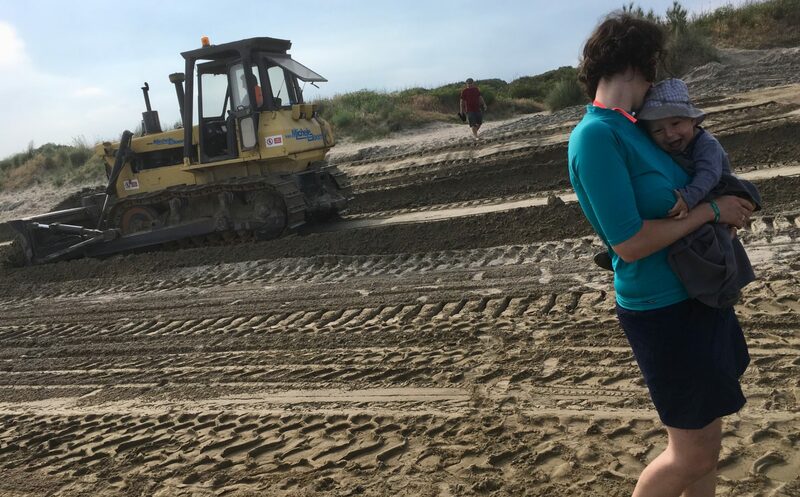 The children play at the beach or just with ankles in water or we build pools in the sand where the water with all the pee gets a little warmer :). There is also a pool in the camp, we do some short bicycle trips in the surrounding and we attend the children disco every evening. 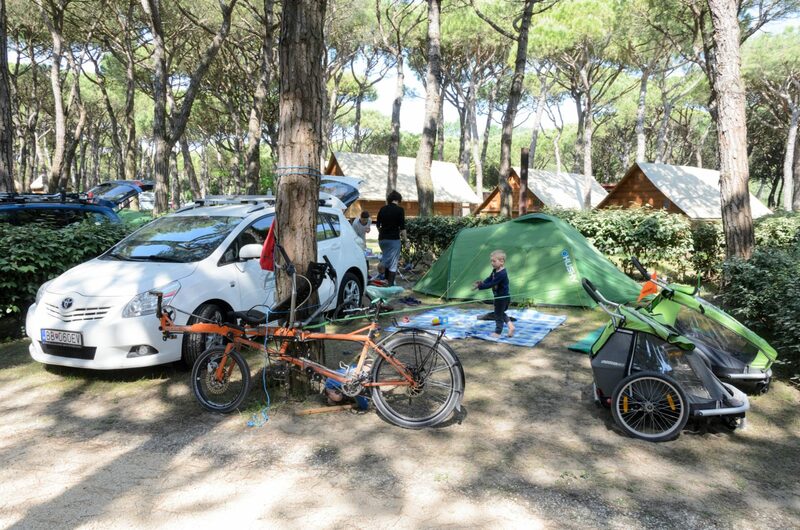 We don’t have much experience with camping with the car and so after couple days of normal opening/closing of the doors and children playing inside the battery gets flat and we need to start with cables. We spend one day trying the Italian healthcare system – Janko has infection in the ear and Matko shut his finger in car door. 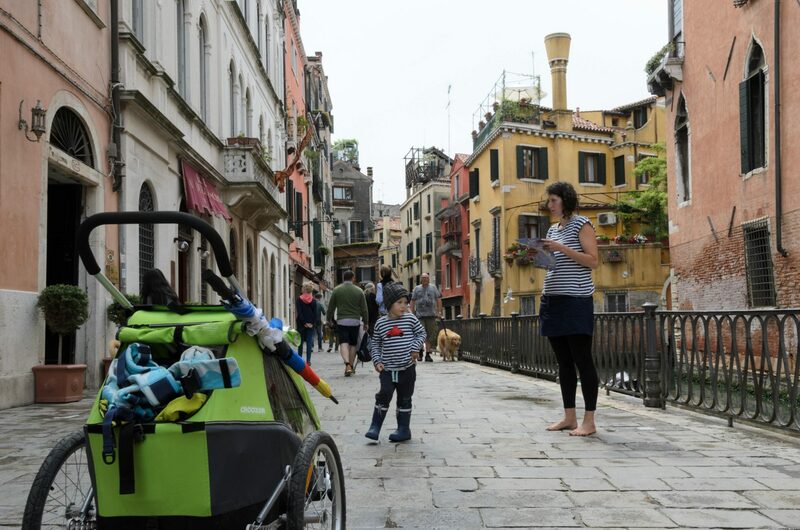 Venice sightseeing is also one day’s obligatory activity. Evit does it barefoot. There are crowds of tourists and many stairs (we wanted to let the children sleep in the stroller but we don’t recommend it). After 8 days it’s time to move on to Lago di Garda. Good weather is forecasted there. During the transfer on the highway Janko starts to scream that he needs a pause so I turn to the first rest area. Some of the parking places are covered with a roof – good idea to not stay on the direct sun… but because of all the screaming and stress I forget we have Rusty on the roof. Fortunately just the straps are torn, the bike is laying on the roof and the front chainring is bent (which I quite easily bend back later). We find a nice camp (San Giorgo Vacanze), spend days at the swimming pool again (children are happy – Kolko is in a small pool and Janko swims with the armbands), we eat our first Italian pizza (actually the cheapest food in the restaurant – much better value than 12€ pasta portion), bicycle a nice cyling path from Rezzato where we eat mulberries along the way. Next destination is Cinque Terre – touristic area with five villages on steep cliffs at the sea. We sleep in camp Gianna which is an olive plantation on a steep hill. We book a boat trip (also a train goes there). The villages are nice and colorful, but also full of tourists. The trails between them are closed so we have to squeeze with hundreds of other people on the boats. In combination with side waves it is not the best feeling. 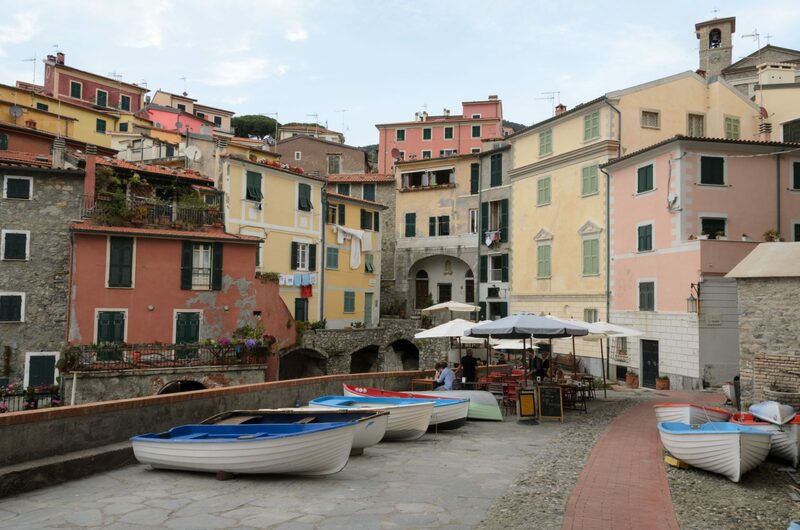 Later we take a walk in the village next to our camp (Lerici) and realize that it looks similar to those in 5terre. We also visit a beach and Janko is fascinated by the fact that in this sea we could swim to Africa. We move again more to east to Liguria through 100 of tunnels and 100 bridges (the bridge in Genoa collapsed 2 months after). 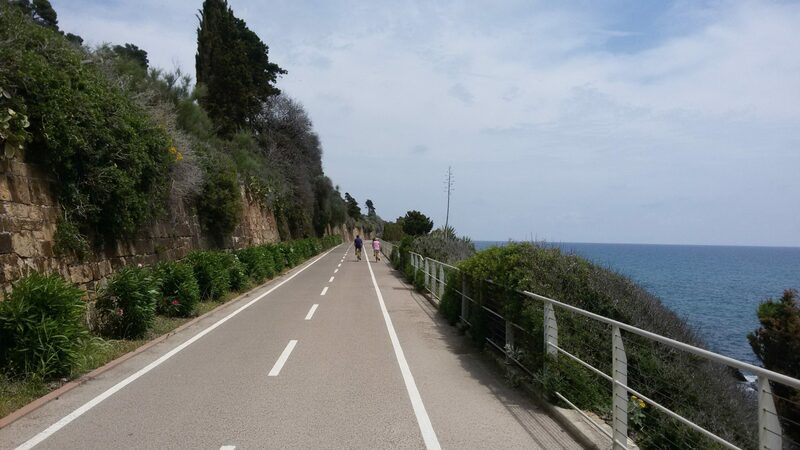 Our destination are not the beaches but a famous bicycle path along the coast on a former railway track (Cycling Riviera cycleway). 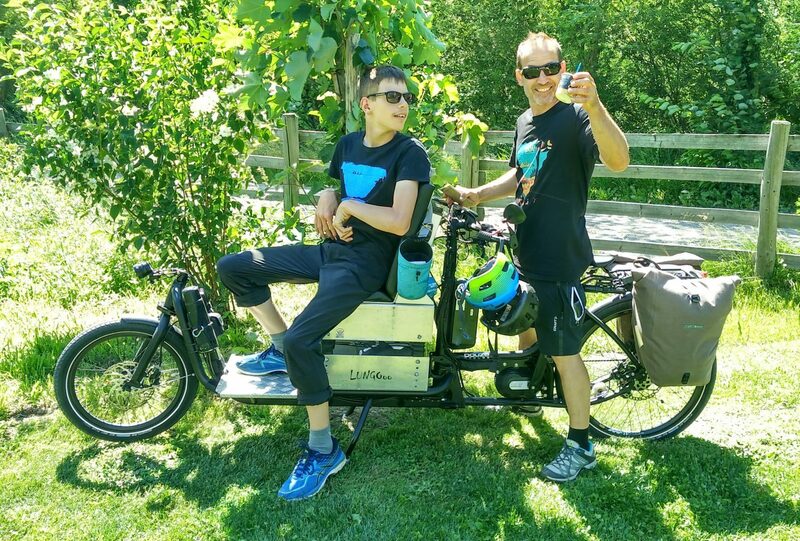 It is really a nice biking there – the path is wide, flat without hills, goes through beautiful towns, along the sea coast and also through tunnels (the first one is 1.5km long and Janko cycles through on his small bicycle). It’s time to say goodbye to our friends – one family heads home and the other will stay couple days more here. For us it was almost all-inclusive vacation in luxury camps till now – our attitude was “we agree with everything” and we just followed our friends who searched for the interesting attractions, next destinations and watched the weather forecast. Now we are switching to the mode “lets see where we’ll end this day”. 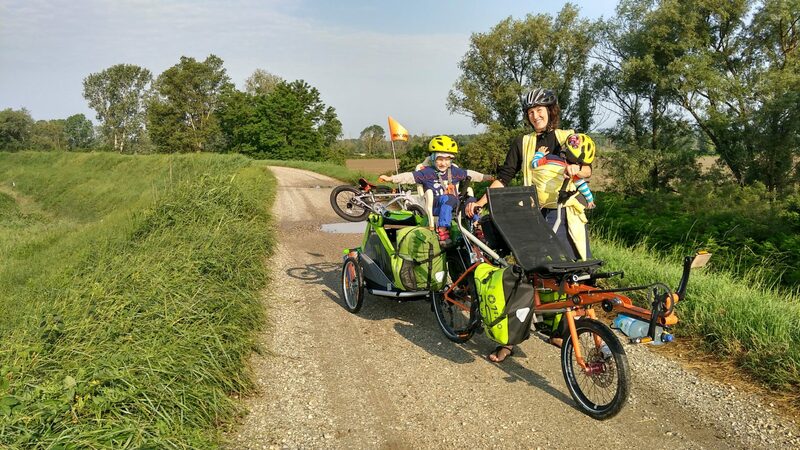 The plan is to cycle along the river Po on the Eurovelo 8 cycling route – it looks like an easy and nice trip with children (like the Danube cycling path). We get to the town Casale Monferrato, park the car at a park next to train station and load the bicycle (it takes quite a while and we are watched by a group of local elderlies). 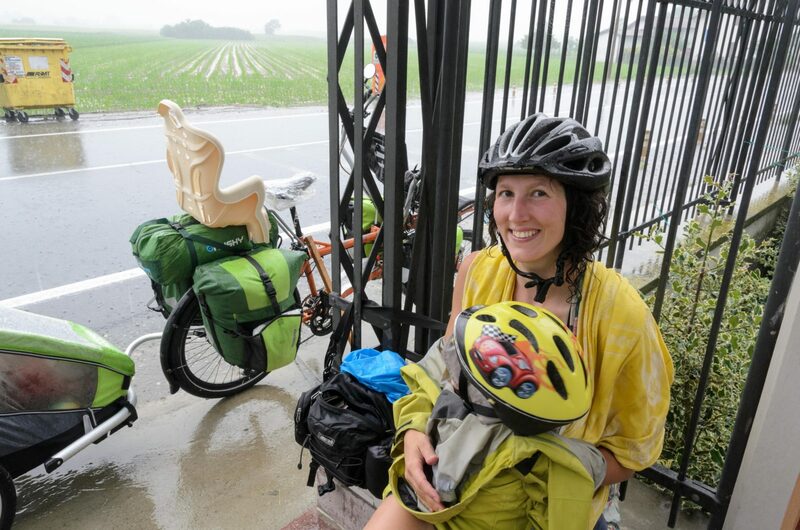 It’s a great feeling to get on such a loaded bicycle with everything we need for life. Our “monster” weights approx 300kg and it looks like a fright train but it’s still OK to control and pedal. Children are happy and satisfied and we are really motivated. But already in the town we cannot find any normal cycling path along the river and so we continue on a bad dust track on a dike and later through forests and fields. We roam through the country close to the river and look for a better route (Janko commented it just at the beginning: “we should return” – maybe it was a good idea :)) We end this searching at a barrier gate where the locals explain us that there is no cycling path here and this track gets even worse (btw: our communication was hands-and-feet together with our Spanish which is surprisingly quite different from Italian). So we turn around and find a normal road. 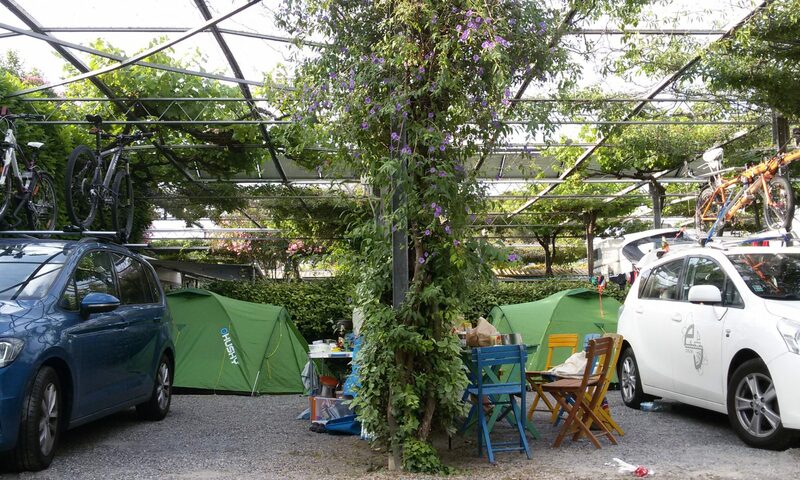 In the evening we end up in a camp at thermal spa which was probably a popular and nice place many years ago. Today we are the only tent here but our children like the local mini ZOO in the resort. We come to see the animals also in the morning and see the feeding – it’s quite sad because they eat the rests from the kitchen mixed with paper towels and plastic bags (but only thing the animals leave are the squeezed lemons). The sky is cloudy and it’s drizzling but it doesn’t look really bad. On the way we stop at a town Valenza. I buy many drugs for 25€ because I’ve had terrible pain in my throat for last couple days and I could survive only on painkillers. Later a really strong rain like a shower hits us when we are passing a long bridge – there is no place to hide, just continue to the nearest village. The way seems never-ending and unfortunately there aren’t any roofs available in the village neither. Finally we find a small roofed gate and wait till the weather gets better. After half an hour a young guy from opposite house comes and invites us for pasta to their home – we happily accept :). Alessandro is 18 years old and his parents tour every year in Europe in their RV and his mother traveled big part of world. That is probably the reason why they offer us to stay for the night and the rest of the rainy day we spend in friendly home atmosphere. We have to leave early because the boys go to school and the parents to work. Janko is sad because there were many toys in the boys’ room. In the evening we got detail instructions about today’s route from the friendly family and their friends – we will go mostly on a dike. Janko can finally use his bicycle and cycles more than 2km. The weather is nice and sunny, we eat lunch at a playground and a woman from neighbor house invites us for a coffee and a shot (again mostly non-verbal communication with hands and feet but it’s fun). The last stretch to town Pavia is on an unpleasant busy narrow road full of cars and trucks. Pavia is a nice historical and students’ town and our host’s place is a big apartment in the center. Our warmshowers hosts are enthusiastic cyclists (there are 6 bicycles hanging on the wall). 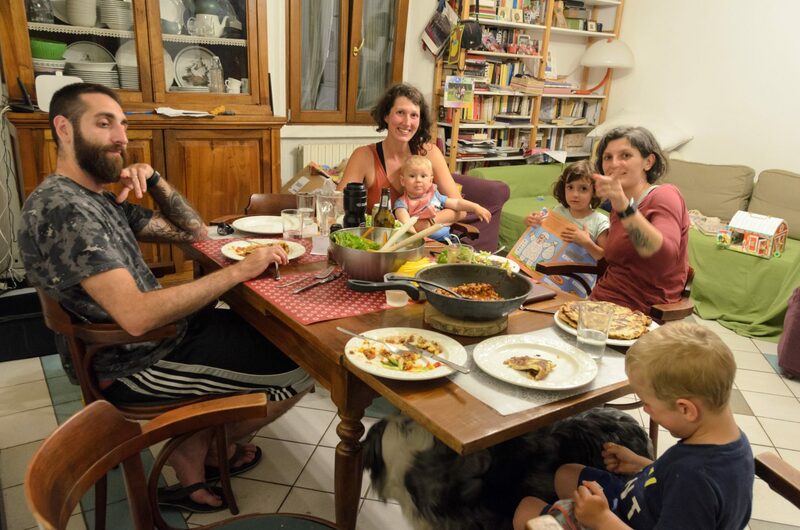 We experience a typical Italian dinner – cooking starts at 21:00 (we are really hungry already because normally we slowly go to bed at this time) and there are like 4 different dishes available. All the people from the apartment meet at the table and talk till late night. I get a 5-day dose of antibiotics from Matia in the morning because otherwise we would spend the day waiting at some hospital (of course it was first consulted with a doctor). We change the plan and follow a nice bicycle path along a water canal to Milan. Evit finds a warmshowers host there and in the afternoon we are parked at their garden. They have house in a nice part of the city, a dog, two cats and two daughters which are a perfect match for playing with our boys. Martina and Mateo leave for a weekend bicycle trip and we can stay at their house – great! (It’s a win-win deal and we should just take care of their dog and cats). 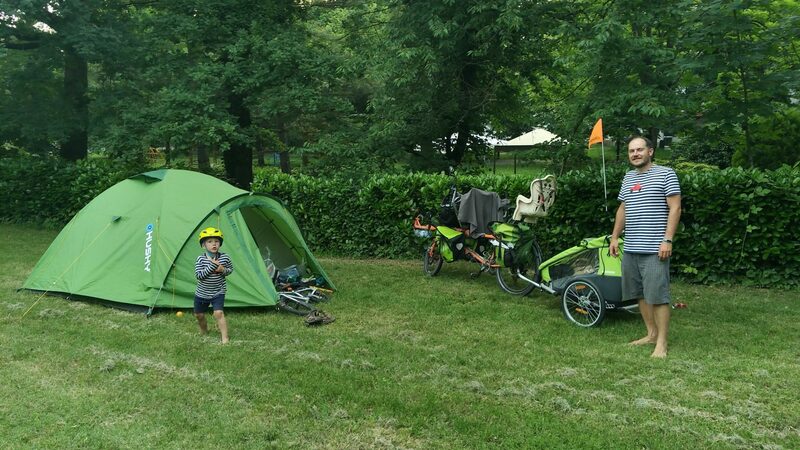 Next days we spend discovering Milan – our Rusty can transport us four easily and we are discovering the city – it’s really beautiful, full of parks where children can play and with wide roads and many bicycle paths. Evit has here one consultation with psychologist – expert on body conscious design (it’s a research trip after all :)). One day I go get our car and I buy more antibiotics in a pharmacy easily without any receipt. Evit is on a playground with children, it’s wet after rain and Kolko crawls around in waterproof trousers. The people ask her if he has any problems with legs and just don’t want to accept the answer “no, he just doesn’t walk yet” (the small children here normally wear stylish clothes and just sit in the stroller). At the end we also visit the real city center crowded with tourists. 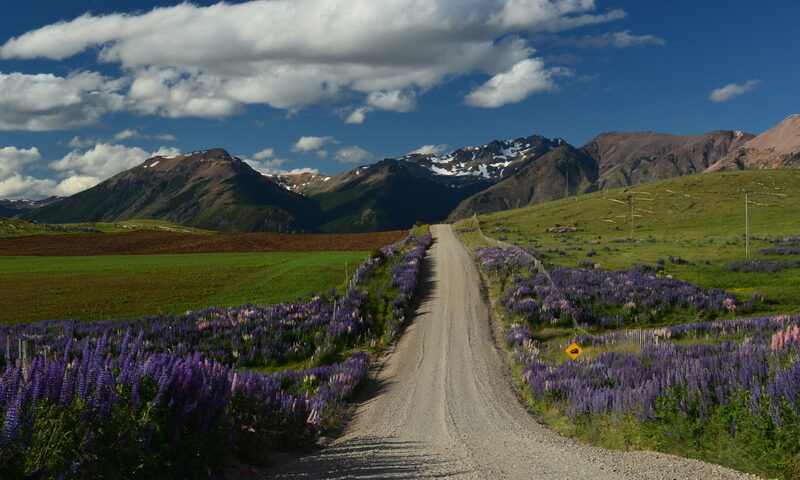 Evit’s next “work” visit is in Morgex – a village under Mt. Blanc. There is the only one barefoot pathwalk in Italy we know about (Italians generally like stylish shoes). It’s really well built round path approximately 800m long with different surfaces and the stands encourage you to use also other senses. The weather forecast for next days is really bad so we decide to move more east. It starts to rain heavily (sometimes even with the wipers running fastest possible I cannot see much) and the sky is dark gray. It rains the whole afternoon and we must eat inside of the car parked at a highway rest area. At dusk we arrive to a village Malnate where should be a camping (camp La Famiglia). 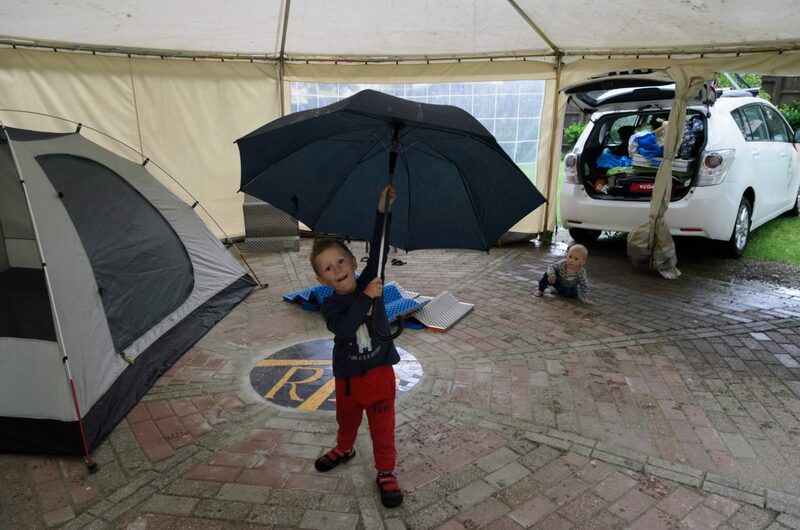 The rain is still very strong and the lady from reception dressed in a raincoat and carrying also umbrella is really surprised that a family with two small children wants a place for a tent in such weather (unfortunately there is no other option available). At the end we can stay under a big party tent! Nuns run this campsite and they are really nice and even prepare dinner for us. Last destination in Italy is Merano – a nice city in Alps close to Austria where almost everybody speaks German. There is a nice campsite in the city which also has a swimming pool. It’s quite cold outside and we are alone in the pool but the water is OK (on the other hand in the shallow baby pool the water is changed everyday and it has no more than 15°C). 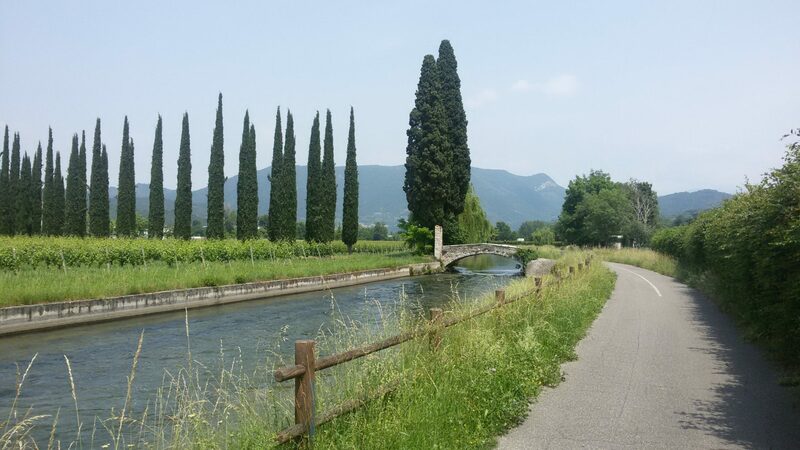 There are many bicycle trails around and we choose one of the easiest ones – cycling path along the Passira river. It climbs up along the mountain spring and in combination with head wind it’s quite difficult pedaling. But the way back is perfect and Janko does a big part by himself on his bike. 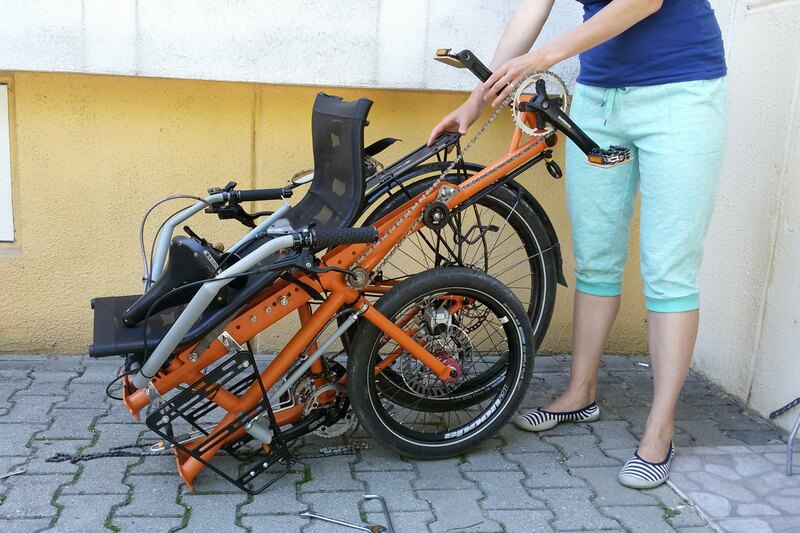 For the first time we meet similar crazy bicycle like our – a father modified a cargo bicycle to carry his disabled son. Merano was actually another part of Evit’s research trip – she met there the designer of fivefinger shoes. 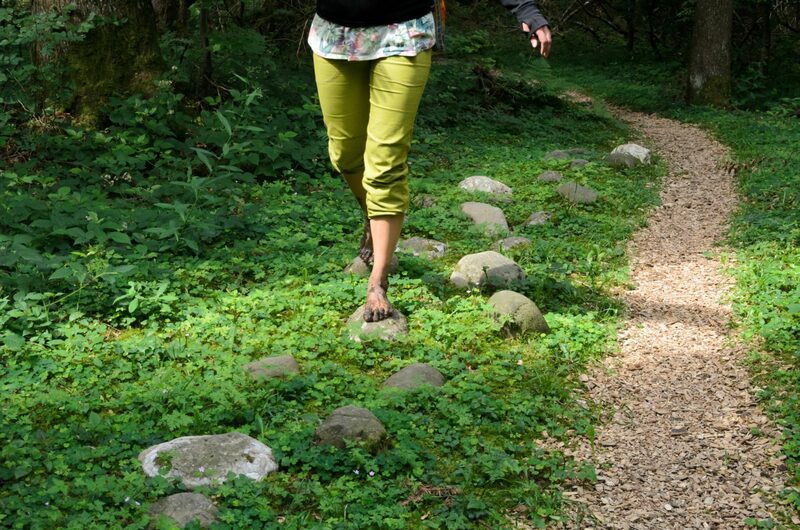 Our next destinations are also connected with barefoot – first we go to Riefensberg in Austria where they have a barefoot trail in a forest. 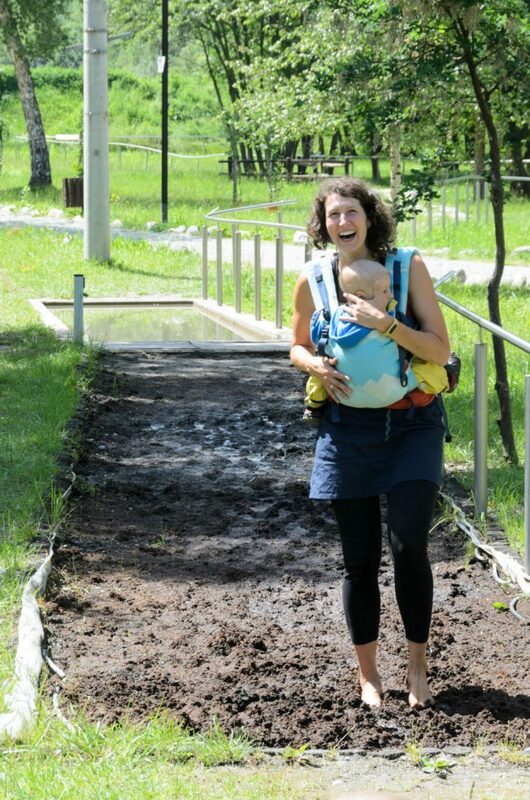 This one is not only about walking on different surfaces but the visitors can do various exercises on the way. It’s Sunday – all shops are closed in Austria and the restaurants are too expensive for us. We try luck in Germany but surprisingly they have the same rules and so we eat lunch at McDonald’s. 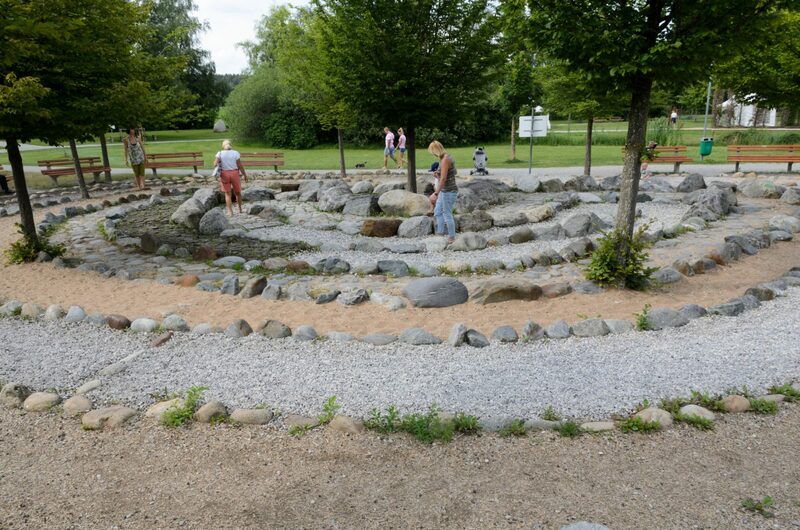 In a spa city Bad Wörishofen (Kneipp who is known by his water therapy comes from here) we walk around the neat spa park – there is 2km long barefoot pathwalk with many stops (Kolko is also starting to walk :)). Then we eat the Sunday’s dinner at another fastfood – BurgerKing. When deciding about the next destination we fast come to the conclusion that it was enough and we will go home… we don’t want to search for another accommodation and see next barefoot area… we have enough of moving to different places everyday … more than one month of vacation is probably sufficient! 🙂 We get into the car and drive to Slovakia – we must go slower at the end because a check engine light appears and our car looses power in the uphill. Fortunately we safely arrive to Bratislava. More pictures with information are in the photo album.